And Here We Go! 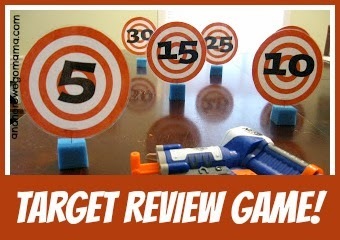 : Target Practice Review Game! 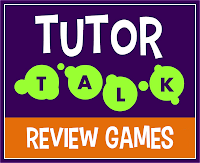 I've got two little boys in my soon-to-be class, and I wanted to make a review game that might appeal to them a little more than my favorite Hungry Frog game (although, really, that's just the cutest widdle game ever!) So, after seeing something similar to this on Pinterest (of course), I came up with Target Practice! Click here to get the pdf and make your own! It's pretty self-explanatory I think. You set the targets up at varying distances, ask a student (or your own child if playing at home) a question. If he answers correctly, he gets to take a shot. Since I have littles (all Kinders I think), I'll just keep one big class score instead of separate tallies for each student; we'll just see how many points we can get as a class. To knock over the laminated targets, I bought the cheapest Nerf gun I could find, and it's pretty awesome! I've never bought a boy toy before, seeing as how I have two girly-girls, and I didn't really know if what I was buying would work. But, it did, and if you have boys, you probably already have some kind of toy gun that would work well for this game. There you have it! If you use Target Practice, I hope it brings some fun and excitement to your review time! Love this! Thank you for the printable! Giving it a try with my 4 and 5 year olds this year. Blessings!